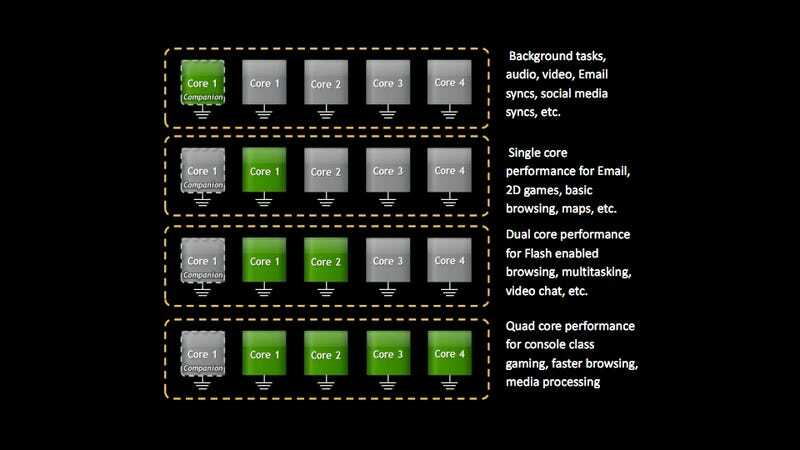 There's a not-so-dirty little secret about NVIDIA's upcoming Tegra 3 platform (which will soon find a home in plenty of mobile devices): the quad-core processor contained within has a fifth core for less intensive tasks. In a paper published by NVIDIA, they provided in-depth details about their Variable Symmetric Multiprocessing (vSMP). Simply put, vSMP implemented in Kal-El not only optimizes CPU multi-threading and multi-tasking for max performance and power efficency at a moments notice, but it offloads background tasks and less intensive CPU activities, such as background syncing/updating, music playback, video playback to the fifth core, which runs at a considerably slower 500 MHz, and therefore consumes considerably less power. Bottom line: battery life! power gating) based on the work load. The "Companion" core is OS transparent, unlike current Asynchronous SMP architectures, meaning the OS and applications are not aware of this core, but automatically take advantage of it. This strategy saves significant software efforts and new coding requirements. The Tegra 3 logic controller also has the power to dynamically enable and disable cores depending on the workload at any given time, making sure not to waste any power from unused cores. So what's the quantitative payoff? NVIDIA ran Coremark benchmark using the Tegra 3 and pitted it against against current industry chipsets, such as the TI OMAP4 and the Qualcomm 8x60 (take these with a grain of salt, obviously). They found that when handling the same workload, Tegra 3 consumed 2-3x less power than the competition. When running max performance tests, the Tegra 3 was twice as fast while still using less power. Compared to the Tegra 2 chipset, the Tegra 3 CPU uses 61% less power while video playback is happening, and 34% less power during gaming activities. While most of the work is done by the GPUs in mobile devices, previous chipsets lacked the ability to ramp down the energy output of unused cores like Tegra 3 is purportedly able to do. What I'm trying to say is that you should be excited for this mobile quad-core processor to arrive and not scared for your battery life.